Over the past thirty-six years in ministry I’ve had the privilege of being involved with a variety of unique opportunities to serve our Lord. Through these experiences, I’ve come to understand that when you get the man you get the entire family. MMC is excited to spend most its efforts promoting a theology that encourages men to become strong leaders in their homes, communities, churches, and our nation. Unfortunately, too many men are in crisis. Our personal observations and current research suggest that some of the cultural challenges men are facing include: loneliness, emotional isolation, confusion over their masculinity, spiritually unprepared, and they have difficulty with intimacy and trust. 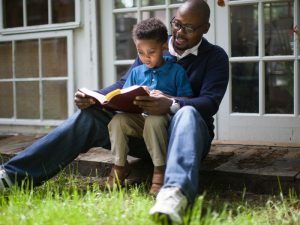 Statistics tell us that when men connect with their faith, 93% of the time the entire family will become faith-filled. When only the woman is involved with faith issues, we know that only 13% of the time she will be successful in bringing the entire family to faith. God’s plan is that men lead the family in issues of faith and they are held accountable to fulfill that plan. I’m excited for the future. Our ministry team has had the privilege of meeting with tens-of-thousands of men who now realize the importance of becoming connected to God’s word. The power of the Holy Spirit is moving through this land as more men realize the importance of having a personal relationship with the living God through Jesus Christ. Please pray for our ministry that we can be fruitful in 2017. Our first quarter is filled with numerous opportunities to serve many churches and men’s ministry programs. Your prayers of encouragement, gifts of support, and feedback enable us to be effective and efficient in the work before us. May God bless each of you this year and that your lives will impact others for God’s glory. How can you help your pastor to better connect with the men in the church and outside the church? Maybe you can pass along this devotional and tell him we are willing and able to assist him with this task. I am part of a small team looking to develop a Men’s Ministry group within our church and have been looking at some of your weekly devotionals. This one really grabbed my attention by the way you highlight the fact that a lot of the traditional men’s roles have been either delegated, or taken, by women. There is a lot of sexual equality legislation and rights movements throughout the world these days and the men in the group I feel are becoming the support act to “the star”, i.e. the wife, the mother. What pointers or references would you be able to give me for an opening discussion based on your devotional please?